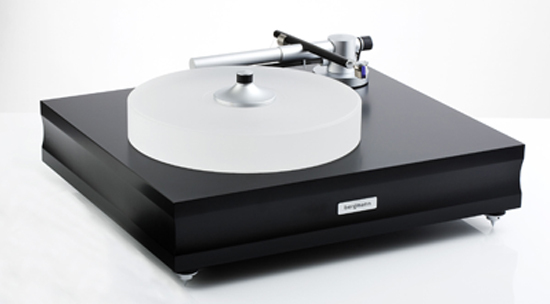 Aaudio Imports introduced the Magne Airbearing Turntable and Tonearm System by Bergmann Audio of Denmark, a leading specialist in airbearing turntables and tonearms into the U.S. market. The Magne is a high-end entry-level audiophile turntable powered by airbearing technology. The airbearing process, of which Bergmann is an innovator, is frictionless, minimizing bearing noise and yielding exceptional stability. It yields emotionally engaging musical reproduction that transmits a vivid and transparent acoustic image. The Magne also includes a linear tracking airbearing tonearm; a silent, dry and smooth air supply; an external power supply, and a heavy clamp to stabilize records. In Danish, Magne means strength, and is also the name of the super-strong infant son of Thor, the god of thunder in Norse mythology. Adhering to Bergmann's “less is more” philosophy, the Magne is built using a simple, timeless design. The Magne's air-supported bearing is frictionless, its speed is exceptionally stable, and bearing noise is reduced to a minimum. The tonearm glides friction-free across vinyl surfaces and only contacts the turntable through the stylus tip and the tonearm wire. The Magne's plinth, or base, is a solid block of fiberboard, topped by an 18.5-pound aluminum platter, a 3.7-pound aluminum subplatter, and a polycarbonate mat, all resting on three sturdy adjustable feet. The Magne's platter is supported by a thin film of dry, smoothly flowing air, creating silent, friction-free movement. It is centered by a steel spindle with a low-friction polymer bearing running through the layers. The tonearm is a hollow tube of aluminum and carbon damped on the inside, balanced by a decoupled counterweight. A powerful belt-driven DC motor regulates record speeds, including finely tunable settings for 33 and 45 rpm. The Magne Airbearing Turntable and Tonearm System is available now from Aaudio Imports at an estimated price of $12,000 (U.S. MSRP) for the table and the tonearm. 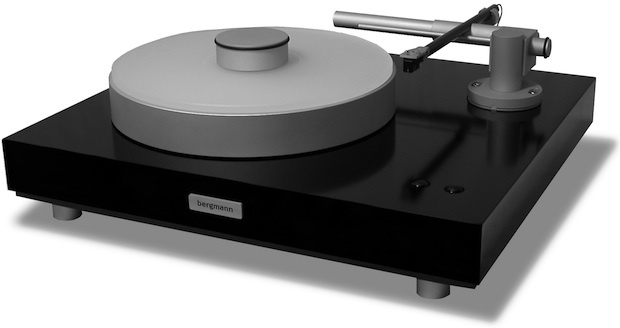 Bergmann Audio is a Danish manufacturer specializing in airbearing turntables and linear tracking airbearing tonearms. Every part is handcrafted in Denmark to optimize the airbearing principle, and achieve the exceptional sound and timeless designs for which Bergmann is known.